We spend a lot of time talking about how to react to change, but we’ve never really discussed what it means to be an agent of change at an organization, and how to implement change effectively. Now, if you're a creative or marketer just starting out in your career, you may be wondering why this conversation is relevant to you. Well, at some point your career, there's a good chance you will either want to do more or will be asked to do more in a way that influences those around you -- and goes beyond the scope of just doing the thing. It could be as small as a new process or tool being rolled out, or you could be a part of a sweeping organization change. But here’s the tricky thing about change, and I’ve said this before -- even when change is positive, it’s still, by its very nature, disruptive. So, how do we make changes effectively and positively when we're asked to step up to the plate? 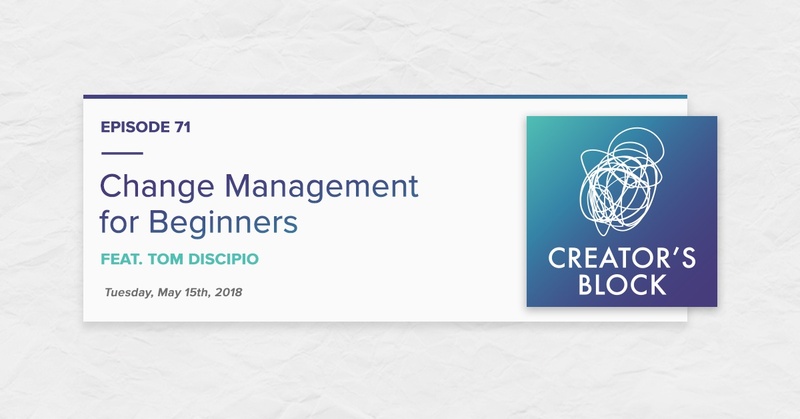 To answer this question, I brought in IMPACT's Chief Strategy Officer (and my mentor) Tom DiScipio to talk through some of the most important insights and pieces of advice we have for those who are stepping into those big change management shoes for the first time. Tom's experience at IMPACT, and how he transitioned from role to role, and from a doer to someone who led people. Why this conversation is important for everyone to listen to and understand, regardless of their role. The most common misconceptions around ushering in organizational change. How do you identify when it's time to make a change? What you need to do before you announce a change. How you actually announce the change. What you should do afterward.